If there were a way for every newborn child to retire a multi-millionaire, wouldn’t every parent want to know it? The concept is quite simple. From the moment the baby is born, you save $1,000 a year in a Child IRA until the baby’s 19th birthday. Then you do nothing. If that money is invested for the long-term and earns 8% (which is 3% less than the average 11% long-term return for stocks), when that child retires at age 70, the Child IRA account would have grown to two-and-a-quarter million dollars. Parents who create a Child IRA must be aware of restrictions which limit whether a child qualifies. Don’t you think parents want to know what they could do right now to allow their child to benefit from a Child IRA? Award-winning writer Christopher Carosa thinks so. 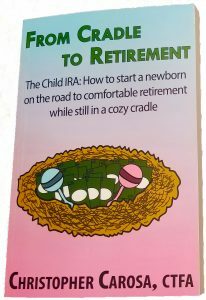 In his new book, From Cradle to Retirement: The Child IRA – How to start a newborn on the road to comfortable retirement while still in a cozy cradle, the veteran financial journalist offers a practical “how-to” guide for parents, grandparents, and their financial advisers seeking to help young children reap the benefits of the Child IRA. Here’s an example you still have time to use before this year’s tax filing deadline. Most college students earn a small amount each year to pay school expenses. This amount usually exceeds the maximum IRA contribution of $5,500. Parents can gift the contribution amount to their child to start an IRA. Since the child pays little to no taxes on those earnings, most financial pros recommend using a Roth IRA. If the parents did this for all four college years, those maximum contributions will grow in excess of $1 million when the child retires at age 70. Using a Roth IRA allows your child to retire a tax-free millionaire. But don’t take our word alone. Ask your tax advisor about starting a Child IRA.